Finding a great apartment takes work. Finding an apartment that is within your budget takes more work. During a landlord’s market, it can be even more challenging to find a great apartment at a great price. Learn how to find a cheap apartment in a landlord’s market. What Is a Landlord’s Market? There are certain times when renters can get a great deal on an apartment and there are other times when renters will have to sacrifice. A landlord’s market occurs when there is a high demand for apartments and a low number of apartments available. In this type of market, a landlord is able to easily find renters to fill their vacancies and can even increase the prices they charge for rent. Strong Demand for Rentals: There are a lot of people looking to rent apartments. Low Vacancy Rates: With the strong demand for rentals, it is easy to fill a vacancy quickly. In addition, with the large number of applicants, landlords have the ability to screen prospective tenants to find the most qualified renters. This will reduce evictions. With higher rental prices across the board, current tenants are more likely to stay put paying their current rent than risk moving out and paying a higher price elsewhere. Ability to Increase Rent: When demand is high for something, the price goes up. In a landlord’s market, landlords have the ability to increase current tenant’s rent and to charge higher rents to new tenants because they know someone will pay it. What Could Cause a Landlord’s Market? There are many factors that could cause an increased demand for rental property. There could be an increased demand for rentals in a certain section of the country or there could be increased demand statewide. Beginning of School Year: Demand for rentals increases before the start of a new school year. This is especially evident around college campuses. New Company in Town or Other Town Redevelopment: If a large company has relocated to an area, the employees of the company may also be relocating and need to find housing. Large Apartment Complex Converted to Condos: This will cause the number of available rental units in the area to decrease, which will increase demand for other rentals in town. Better Public Transportation Options: If there is a new bus route, rail line or other system that makes it easier to access jobs in the city, the area will become more desirable to live in. Higher Interest Rates: When interest rates increase, it becomes more expensive to buy a house. Therefore more people will turn to renting instead of buying homes. High Home Prices: When real estate prices are high, some people may not be able to afford to buy a home, so they turn to renting instead. Sluggish Economy: In a sluggish economy, interest rates may be lower and home prices may be lower, but unemployment may be higher and salaries may be lower, so it could be still be challenging to afford to buy a home. Why Is a Landlord’s Market Bad for Renters? A landlord’s market is bad for renters for a number of reasons. More Competition: There will be more competition for apartments, so you may lose out to tenants with better credit, higher income or those that were able to give the landlord a deposit quickly. Higher Rents: You will have to pay more for the apartment and since many lease agreements are for a year, you will be locked in at this price for at least a year. Compromise on Your Apartment Wish List: Since rentals are more expensive, you may have to compromise on the amenities you want in an apartment. 1. Can You Look in a Different Location? You may be able to save money by simply looking for an apartment in the next town over. While it may not have been your first choice, if you are able to save two thousand dollars a year and get a potentially nicer apartment, all for an extra ten minute commute, it may be worth it. You may find a deal by targeting landlords that are not so technologically savvy. 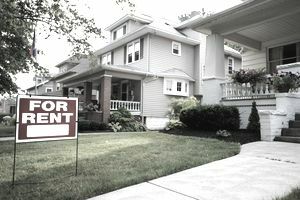 Mom and Pop landlords may not be as aware of the current landlord’s market as those landlords that own multiple units. You can physically drive around your desired location and look for “For Rent” signs in the windows. You can also look for “For Rent” flyers on bulletin boards at the grocery store, churches or Laundromats. Word of mouth is also a great way to find an apartment. Tell everyone you know that you are looking for an apartment. Someone’s mother’s, hairdresser’s grandmother may have just what you need. Splitting the rent with a roommate can easily save you money. You may actually be able to live in a nicer apartment because you will each only be responsible for half the bills. Good apartments go quickly. You should look for apartments three times a day, morning, noon and night. Especially when rents are high, affordable apartments can be gone in as little as twenty four hours. You can easily cut costs if you look for an apartment yourself rather than hiring a real estate agent to do it. Real estate agents typically charge one month’s rent as commission, so you will put a significant amount of money back into your pocket by finding an apartment yourself. One way to save money is to compromise on your apartment wish list. Fourth floor walk ups are less desirable, so they will be cheaper than apartments on lower floors. You can also see discounts for apartments on busy roads or those that are too close to train tracks or bus depots. Some landlords are willing to offer a reduction in monthly rent if you are willing to help with certain maintenance duties. This could include taking out the garbage, shoveling snow, raking leaves and keeping the common area clean. Even in a landlord’s market, you may be able to find a cheaper apartment if you wait until the winter. Fewer people move in the colder months, so if a landlord is faced with a vacancy, they may offer a reduced rent to get it rented quickly. It is a long shot, but rent controlled apartments still exist. These units are rented for far below market rate because the landlord is only able to raise the rent by a certain percentage each year. Large apartment complexes are your best bet for finding this type of property.